Most of our sales are of supplies - but several times a year we take on special projects that interest us for completed projects. 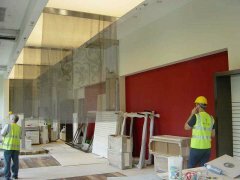 We've been involved in a great number of commercial and industrial projects over the years - including film! The following is just a sampling of those projects - there are many many more. We don't always get images back of the finished pieces or their use and sometimes there are non-disclosure agreements. So some in the list will not have pictures or will have poor in process pictures from in our shop. Some of the examples below were made by special customers like designers that we've worked with - credit for the completed projects are as noted. Our intention is to maintain this post going forward with all new projects. 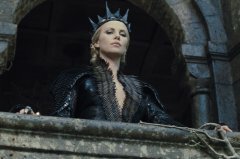 When we’re hired to work with a costume designer for a movie, a lot of the time what we make is reinvented once it is on set. A good example of this is The Hobbit where we sent a staff person to re-do all of the scale pieces we had made. In some cases we don’t know what the will appear on film until we see the film. 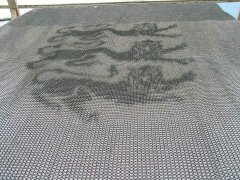 We made 10 sheets of European 4-1 that were 1m x 1m using Saw Cut Anodized Aluminum in 16g 5/16". 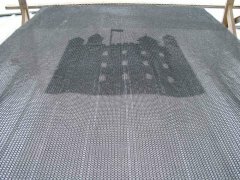 We made 10 square panels ~2ft x 2ft using Black EPDM and Bright Aluminum in 16g 5/16". 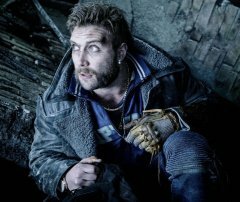 We sold the costume designers 2 finished chainmail gloves used for Captain Boomerang. 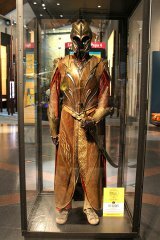 We also sold supplies to the costuming department for this movie - they turned them into this costume for Enchantress (also posted in our gallery) They bought ~100 ft of chainmail strap (welded stainless chainmail). They also bought ~10,000 square anodized bronze 1" tags, ~10,000 bronze jump rings and punches for making holes. 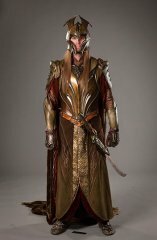 We sold the costume designers for this movie silver and gold colored rings in enameled copper and anodized aluminum in 19g 532". Their designer assembled them. 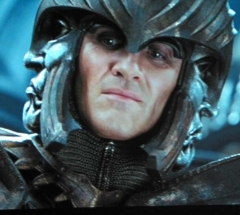 You can see the gold connecting the shoulder plates in the one image. 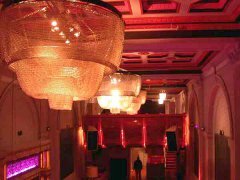 We did a lot of work for Seventh Son. 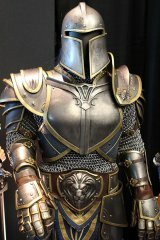 Not only did we get to supply the scales for the awesome Mother Malkin's Dresses made by MailleTec - we also got to make 20 full suits of hybrid polycarbonate / chain armor! We made punched 16g 3/8" stainless connected with 16g 5/16" aluminum. 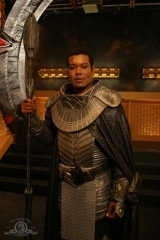 The armor was made using overlapping shaped and laser engraved polycarbonate plates to make a double row on the chest. We made overlapping plates to cover the arm from shoulder to elbow - but they don't appear in any costume pics. 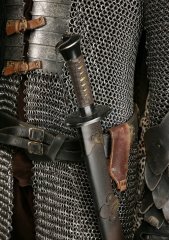 We also made shaped greaves from laser engraved polycarbonate - they are made from 3 plates connected with thin strips of chainmail that cover the shin and calf. These plates and chain are seen on the Assassins. The movie costuming staff painted these plates so they will not be clear as we made them. The red and black dress was made by MailleTec.com using of course our scales. There is a post on Facebook with lots of pics including some of the process. 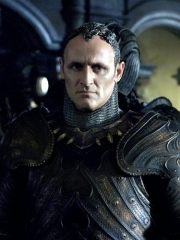 Since the dress was vetoed Dane Duncan of MailleTec.com went to the filming location and custom made the black scalemail bodice referred to as the Double Vertebra Dress. 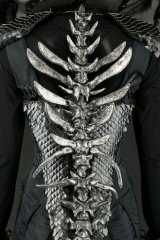 This scale portion of the Double Vertebra Dress was made by MailleTec.com using of course our scales and is the dress used in the film. 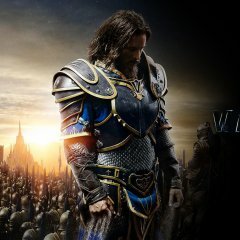 In 2011, we were contracted by Weta Workshop to make 40 shirts for elf armor. The assembly didn't end there though! 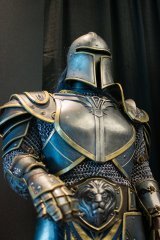 Eric Matwe, our staff member at the time and now and owner of MailleTec.com, was then flown down to the set in New Zealand and got to work with Weta costumers to re-imagine the scales and how they fit with the rest of the Elven armor. The scales are small champagne anodized aluminum. We made 4 shirts for Lancelot. 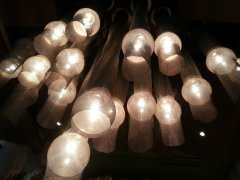 They were made using square wire stainless steel rings and rubber. 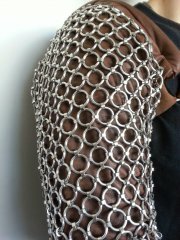 We made a replica of the original Spartacus arm piece that was used to shoot a scene. Pics are in-process shots taken in house. 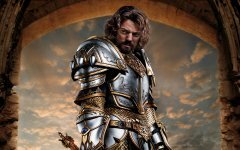 Three-time Oscar winner Colleen Atwood designed the costumes for Snow White and the Huntsman. They assembled our scales and rings - 16g 5/16" stainless steel rings and small blackened stainless scales. 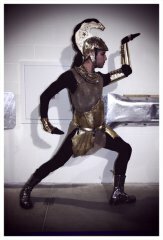 There are videos of the costumes and comments on assembly if you click the above images. 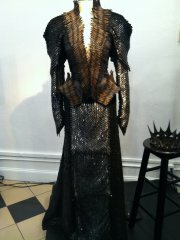 Their costuming design team purchased and assembled our scales. 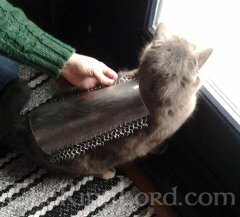 TheRingLord made machine made welded stainless chainmail for the Jaffa. 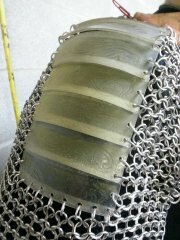 TheRingLord made 4 heavy byzantine weave chains using nickel silver rings. TheRingLord.com made 2 small scale shirts made from black stainless. We polished them for about a day to look "less evil"
We made 8 aluminum and rubber shirts. 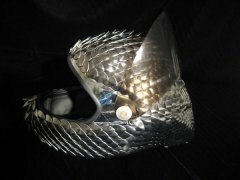 We made 2 small welded stainless chainmail mantles. 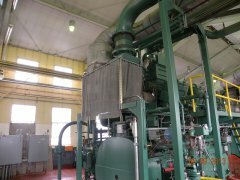 We also sold them 250,000 mild steel rings that they used to connect plates together. 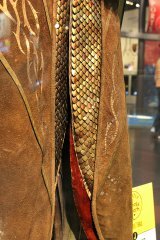 TheRingLord made a shark suit worn by Jessica Alba. 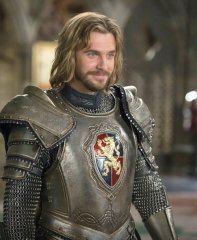 The costuming department for this movie purchased sheets of machine made welded stainless chainmail. It was intended to be used on horses. 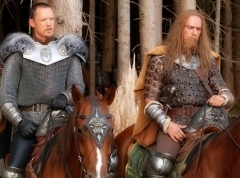 Weta Workshop bought machine made fabric from us for this movie. 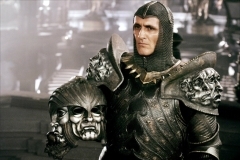 It was used for the King’s head piece. 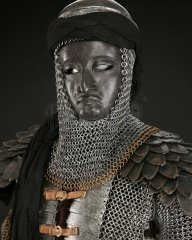 TheRingLord made a coif for Lord Marshal using machine made welded stainless chainmail. TheRingLord made machine made welded stainless chainmail coverings for chairs in the lair control room. Mystique sat on it. We made 8 chairs and 1 is shown. 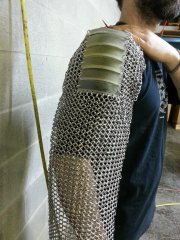 MailleTec.com medium mesh was used for Brienne’s armor on Game of Thrones! 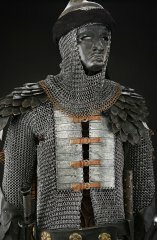 In the episode ‘Oathbreaker’ Brienne was given a gorgeous new suit of armor which has our mesh used around the leather patches on the skirt and arms. This project is very recent and we don't have pics from the show. Above is an in-process pic of the first prototype. We made 8 shirts using 1/2 rubber rings and half titanium colored anodized aluminum. 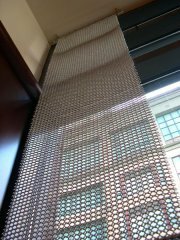 TheRingLord made a chainmail curtain that was ~200 sq ft of machine made stainless fabric. We don't have any pics of it in use in the show. TheRingLord made a loin cloth using 14g 3/8” aluminum. 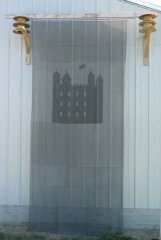 TheRingLord made a 10ft x 20ft curtain using etched aluminum. 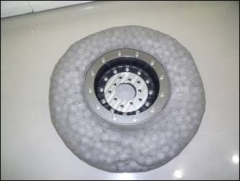 This is more of an industrial project but we made inconel chainmail to protect actors from moving parts under water. 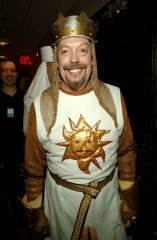 We made ~ 10 coifs for Arthur for the musical on Broadways and Travelling shows - including the ones worn by Tim Curry. 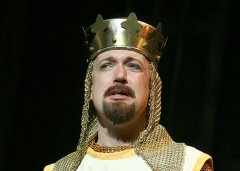 There were several productions; including travelling shows and each got few coifs. We used 18g ¼” machine cut gold anodized aluminum rings. This is local theater for TheRingLord head office in Saskatoon. 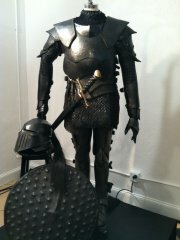 We have enjoyed working with local designers and helping them with their costuming needs for many years. ArcAttack is a Tesla Coil Entertainment group as seen on America’s Got Talent. 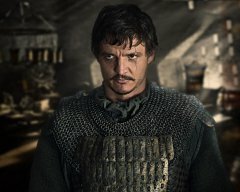 TheRingLord.com was happy to work with them to create a full chainmail suit - similar to those we have made for shark suits. 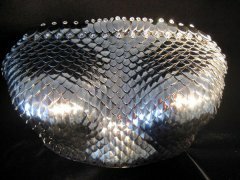 It is made from medium machine made welded stainless chainmail. Each stainless ring is 22g 5/32". We made pants with socks, shirt, gloves and a full head cover. 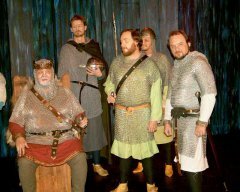 We have also supplied chainmail to other small theater groups in various cities in North America. Pictured is the Yellowknife Theater Company. 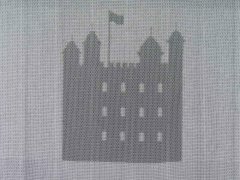 The Tower of London – We hand wove inlayed curtains that were on display in the gift shop. 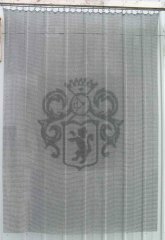 We made 4 curtains using 16g 5/16" aluminum with blackened steel inlays. 3 curtains were ~10ft x ~15ft and one was ~10ft by ~20ft. 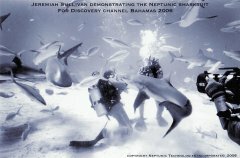 This was our first large commission and was in 2003. Trivia #1- we micro-stamped rings on each banner near the bottom with "TheRingLord". Trivia #2 - TheRingLord founders Jon and Bernice Daniels have a matching lion made with black and regular stainless in 18g 1/4" as a personal memento. 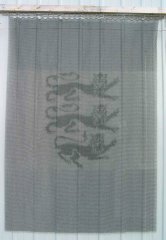 The last image posted here is the memento banner. Trivia #3 - the pic of the banner hanging outside is a test hang on our shop. The poor maillers are "walking out" accidental contractions in the maille to make it hang perfect. 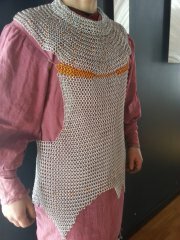 I recommend not mentioning this if you meet them - 1 contraction was over 4 ft into the maille. Trivia #4: We got a commission letter stamped/signed by the Queen. 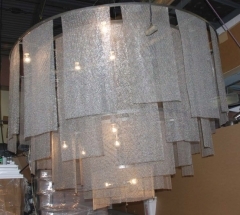 TheRingLord made 160 lamp shades used for the high roller suites in the Bellagio in Las Vegas. They were made using machine made welded stainless. 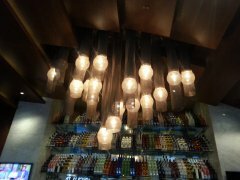 Trivia: The founders Jon and Bernice Daniels made a few extra of these lamps shades for a pergola in their yard. 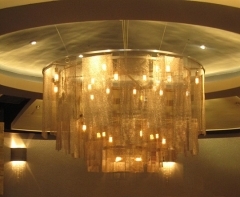 TheRingLord made lamp shades for a large abstract lighting arrangement. They were made using machine made welded stainless. 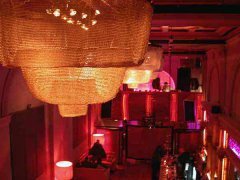 TheRingLord hand wove 12 curtain panels using 12g 1/2" bright aluminum rings. 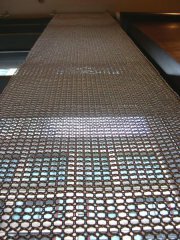 TheRingLord made a welded stainless chainmail curtain. The above image is an in-process pic of a quality check. 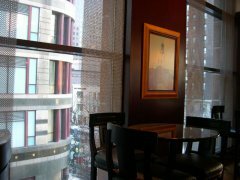 We look for and fix accidental contractions and issues that make curtains hang wrong. 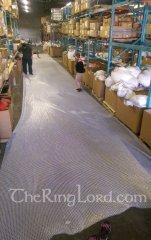 TheRingLord wove a 1.13 MILLION ring curtain project in 8 weeks! 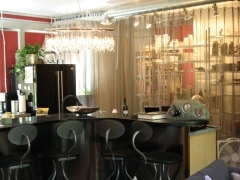 The 3 curtains were each 10ft x 65ft and made from saw cut anodized aluminum 12g 1/2" silver color rings. Each curtain weighs 500 lbs. We employed ~25 people over 8 weeks and had a machine assist to meet this time frame. 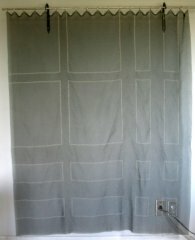 Pic is 1 of 3 curtains being inspected before shipping. 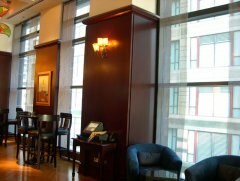 Curtains will be draped like a sun shade in the Hilton Double Tree - McAllen Texas. 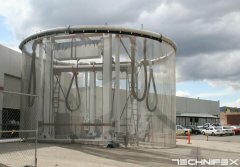 They will be hung using aircraft cabling. Click on an image above to see a rendering of the proposed install. 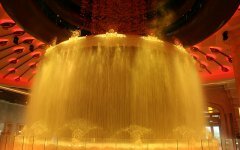 TheRingLord worked with Technifex and MailleTec.com to produce this HUGE curtain used in a water feature. 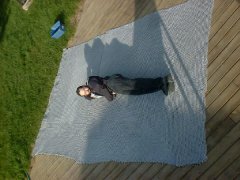 In terms of square footage and number of rings, this is the largest single panel chainmail curtain project we've done! Likely that has ever been done...! 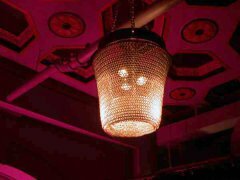 TheRingLord made 8 smaller and 4 very large chandeliers using 12g 9/16” etched aluminum. The smaller ones were 2ft in diameter. The larger were 9 ft in diameter. All of the rings were hand woven. TheRingLord made Burberry's signature plaid as an inlayed chainmail curtain for their flagship London store. 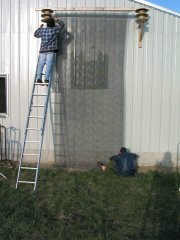 Images are of the panels in-process in our facility. The above image is just one residential project of lots! 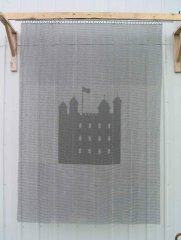 We've made several fireplace screens - both hand woven and using machine made welded chainmail. We've made curtains, room dividers, cushions etc. 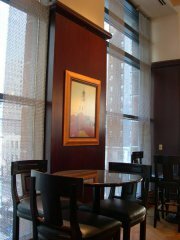 Most residential projects are commissioned by an architect or interior designer - we do work directly with clients as well. 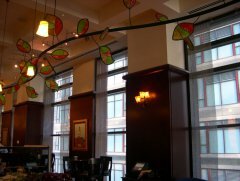 This lamp, called Sambucca, is 7ft in diameter and 7ft high. 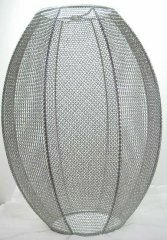 It was made for a restaurant using machine made welded stainless chainmail. 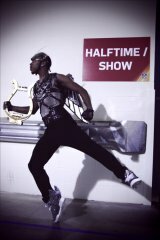 MailleTec.com made 3 shirts including a stainless steel small mesh vest worn during Vogue at the Superbowl halftime show. Click any of the images to see the video of the performance. Michael Schmidt purchased our scales and designed wardrobe for Fergie Black Eyes Peas for their performance on American Idol Gives back 2010. Click on any image above to see the video of the performance. This corset was designed by The Blonds and debuted in their fall 2010 fashion show. 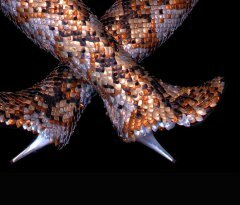 It was worn by Miley Cyrus in her music video for "Can't Be Tamed"
Click an image above to see the video. Kesha wore a scale top on American Idol Season 9 2010. It was made by unknown designer. Click the image above to see the video. Most of the following projects will not have images - some for proprietary reasons, some we've signed NDAs. The Ring Lord scales are ON MARS! 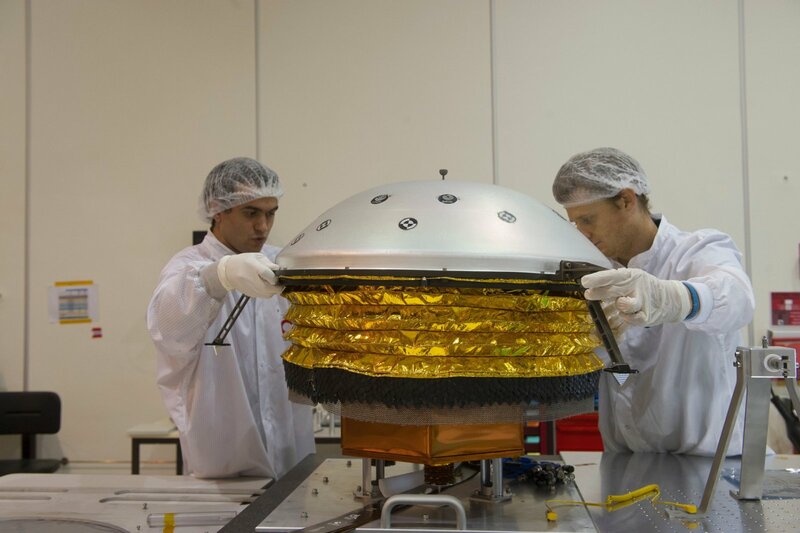 Insight landed on Mars Nov 206th 2018 and with it some custom scales made for special heat shielding. The above image is an install of an industrial punch guard. Boeing – punch guards. 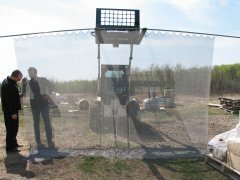 Chainmail panels that protect workers from exploding punch dies. 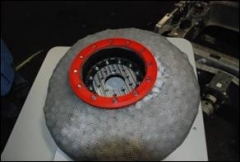 JPL Laboratories (NASA) – Mars Rover heat shielding. 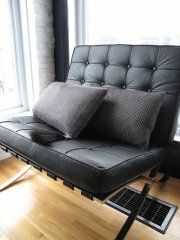 We developed our thinner small scale for this project. 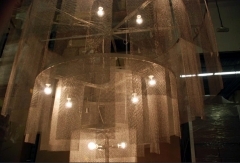 Kohler – masks for glazing - chainmail produces a woven effect when used as a mask. 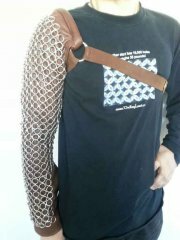 Lumberjack Leg Protection - TheRingLord worked with Jason Wynyard of NZ to create chainmail lumberjack leg protection. Jason Wynyard is a champion woodchopper from New Zealand who has won over a hundred world titles in the sport.